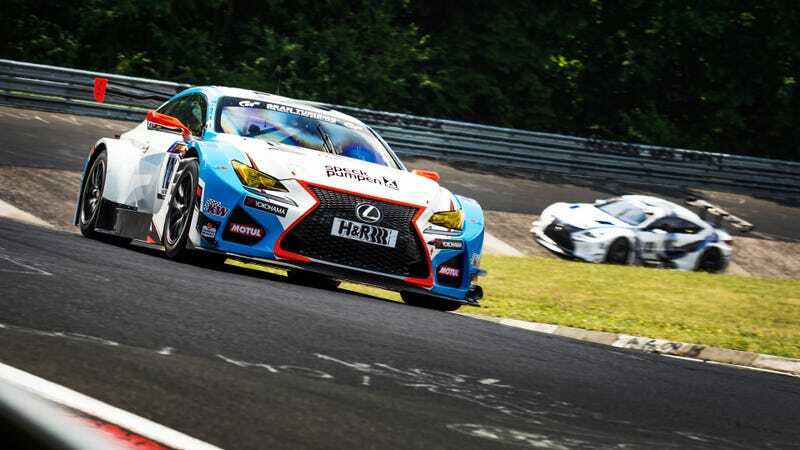 The Lexus RCF GT3 cars were getting a shakedown to prepare for their first VLN race on the 4th of July. The RCF with the red/orange accents was driven by Dominik Farnbacher together with his brother Mario. When getting to shoot at the track, I try to not take the generic pictures where everything is pretty much standing still. There are so many photographers out there that are just satisfied with getting the shot, that I want to stand out with quality work, I want to show the action in the picture. This costs me a lot of time and I easily lose over 50% of the pictures due to poor focus or image blur, but the good ones, well they are keepers for sure. Key to these shots is getting good equipment (lenses especially) and lowering your shutterspeed to capture action. This requires a little panning or tracking the subject so the car hasn’t already gone past the focus plane before your camera grabs the image. This picture was taken on a Nikon D7100 with a Nikkor 70-200mm f/2.8 lens. Settings: 70mm f/5.0 at 1/250th of a second and ISO 100 . Great tips if you’re a photographer! And if you prefer to have other, more talented people take your photos, give Mathias a Like on Facebook.